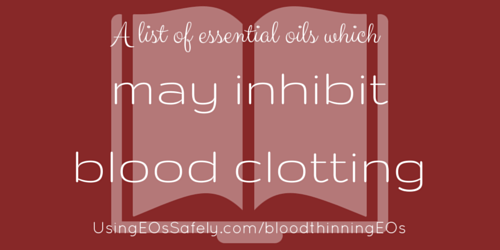 Some essential oils may inhibit blood clotting. This means, the blood can become thin and you can be at risk for bleeding out during surgery. Not everyone will need to be overly concerned about knowing this information, but for some, the risks can be fatal. In most cases only the method of ingestion is not recommended, and topical use is considered safe. 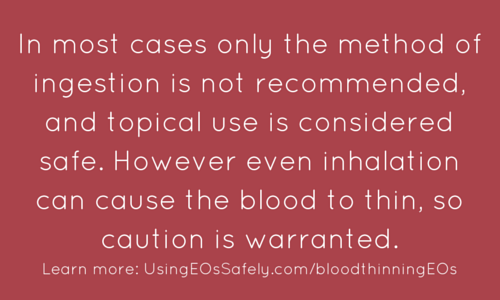 However even inhalation can cause the blood to thin, so caution is warranted. 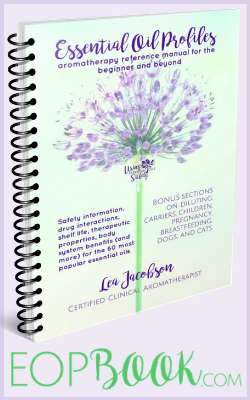 One example that Essential Oil Safety shares: an 85-year-old woman was admitted to a hospital with acute cardiovascular problems, and was prescribed heparin, followed by warfarin. Some weeks after leaving the hospital she returned, suffering from gross vaginal bleeding and subcutaneous hemorrhaging on various parts of the body. 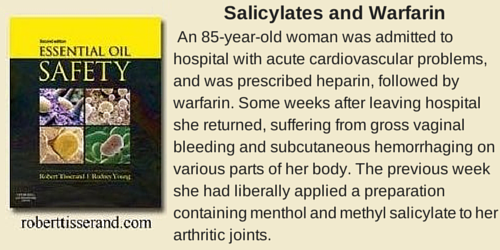 The previous week she had liberally applied a preparation containing menthol and methyl salicylate to her arthritic joints. Be sure to consult with your health care provider before you use any of these essential oils. 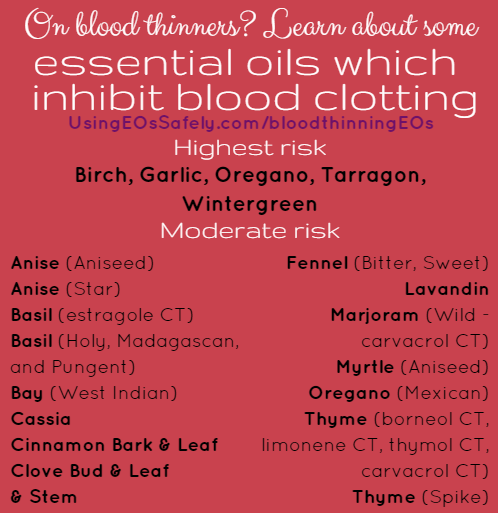 These essential oils are listed in Essential Oil Safety as those which present the highest risk of thinning the blood. Take care to note the Latin names which distinguish the essential oil from other species which may not inhibit blood clotting. Here is a list of some of the essential oils which are listed in Essential Oil Safety as those which may inhibit blood clotting and should be used with caution. I have been taking Plavix for a couple of years. This year I’ve started using essential oils for various things. I have been using wintergreen for arthritis but not on a daily basis. I’ve been diffusing a lot of cinnamon and clove the last few weeks for the fall smell. Had a cold last week and have used oregano as well on bottom of my feet. I’ve noticed some bruising marks showing up on my legs in various areas the last few days. Should I be concerned?